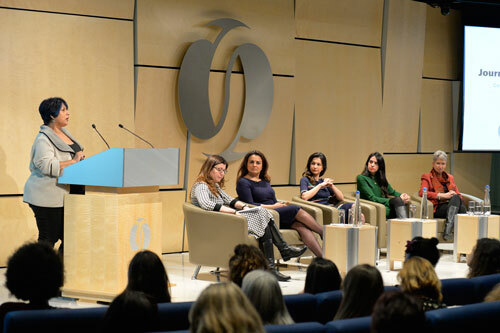 In the run up to International Women’s Day, a panel of prominent female journalists have challenged stereotypes, orientalism and misconceptions of Arab women in the newsroom. The event title, The Rise of Women Journalists in the Arab World, was contested by City University London Senior Lecturer Dr Zahera Harb. 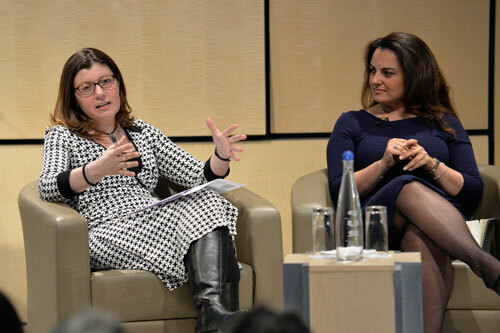 Dr Harb (right) argued that it is not the rise of women reporting the Arab world that should be explored, but the rise of women journalists with roots in the Middle East bridging the divide across language and geography so audiences in the west can hear stories from a perspective closer to the heart of events. Saudi journalist and filmmaker Safa Al-Ahmad also pointed to orientalism – carrying one static view of the Orient – as a problem. She struggled pitching stories to news outlets with narratives contrary to the understanding of the editors. Al-Ahmad said she experienced greater discrimination as a women working in white, male-dominated newsrooms than she did in the Middle East. “It’s difficult to get stories commissioned that challenge stereotypes – it took me two years to get a commission for the Saudi protest film,” she said. Al Ahmad’s film Saudi’s Secret Uprising (2014) was commissioned by BBC World Service and achieved international acclaim and recognition. Despite the challenges of orientalism, the journalists explained that being a woman has been frequently advantageous in providing access to people and situations where men would otherwise be barred from going. Yalda Hakim, an Afghan who was raised in Australia and works for BBC World News, said every time she goes to a new place, she visits hairdressing salons – places where women talk freely. “I can gather unique insight about the local people and understand the community better,” she said. Al-Ahmad added that being a woman made her non-threatening to authorities and gave her access into restricted areas. Lindsey Hilsum, International Editor at Channel 4 News, chaired the panel. She has reported from many countries in the Arab world, including Syria and Iraq and recently on the refugee crisis in Europe. Alongside the BBC’s Lyse Doucet and Lady Jane Wellesley, Hilsum started the Marie Colvin Circle in honour of the former Times correspondent, who died while covering the siege in Homs, Syria. The event was to mark the introduction of Marie Colvin journalists' network in support of female journalists working in the Middle East and North Africa that “brings together experienced journalists with courageous reporters, often working with little or no support, to create a vibrant online community – providing practical support, mentoring and lively discussion”. Dr Harb, of the Department of Journalism at City, has been nominated as one of the network’s mentors. The event was sponsored by One World Media, a non-profit organisation that supports international journalism and promotes media coverage of global issues. It was held at the European Bank for Reconstruction and Development. In 2012, Marie Colvin was posthumously awarded the Special Award at the James Cameron Memorial Lecture, which is held annually at City. Megan Howe and Anne Schwedt are International Journalism MA students at City University London.